This adhesive transfer gun applies double sided transfer tape and simultaneously rewinds the tape liner inside the dispenser. Covered gears minimize applicator jams. Transparent cover shows remaining tape. 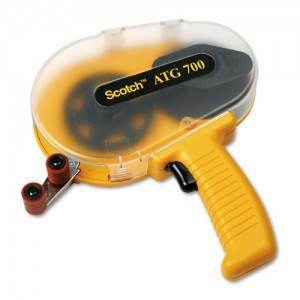 Holds up to 60 yards of Scotch Adhesive Transfer Tape. Tape is not included. Packaged six dispensers per case. ← Back to "Hand Held Tape Dispensers"